President Trump announces his emergency declaration during a Rose Garden event at the White House on Friday. The president and his advisers couched the emergency declaration as a routine move by the executive branch to redirect money Congress has authorized, just as previous presidents have done dozens of times. Critics scoffed at that argument and accused Trump of an illegal power grab. The emergency declaration is designed to free up more than $6.6 billion for Trump's controversial border wall, after lawmakers rejected the president's demand and approved only a fraction of the wall funding Trump had asked for. Trump insists the extra money is necessary to control an influx of illicit drugs as well as people fleeing poverty and violence in Central America. 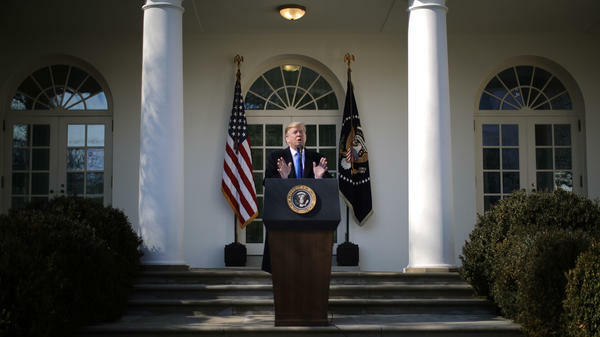 "We have an invasion of drugs and criminals coming into our country," Trump said during a Rose Garden ceremony to announce the emergency declaration, a claim NPR has previously fact-checked. His plan would redirect money from the Defense Department and the Treasury to supplement the $1.375 billion Congress authorized for the wall. The extra money would allow the administration to build more than 230 miles of border barrier, rather than the 55 miles lawmakers approved. The administration insists there is nothing unusual about a president moving money around like that. "This is authority given to the president in law already," acting White House chief of staff Mick Mulvaney told reporters. "It's not as if he just didn't get what he wanted so he's waving a magic wand and taking a bunch of money." Aides said it's within the president's power to shift some funds around even without declaring an emergency. But the White House says the declaration does give the president some additional flexibility. According to the Brennan Center for Justice, presidents have declared national emergencies 60 times (including Trump) since the power was codified in 1976. Although the law — passed in the aftermath of the Vietnam War and Watergate — gave Congress the right to challenge an emergency declaration, most have been uncontroversial. "There's rarely been a problem," Trump said. "They sign it. Nobody cares. I guess they weren't very exciting." Trump's declaration differs from many of those earlier emergencies. About three-quarters of the time, presidents use their emergency power to impose economic sanctions or limit trade with foreign parties. Then-President Jimmy Carter, for example, declared an emergency to limit business dealings with Iran. George H.W. Bush did the same with Iraq. And Barack Obama used emergency powers to limit transactions with Libya. Other declarations have followed terrorist attacks or natural disasters. George W. Bush declared an emergency after the Sept. 11 attacks. And Obama used one to respond to the swine flu epidemic in 2009. Critics say Trump's declaration is categorically different, in that the president is using his power to fund a border wall far bigger and more expensive than Congress was willing to pay for. "This is not 9/11. This is not the Iran hostage crisis of 1979," California Attorney General Xavier Becerra said in a news conference on Friday after Trump's remarks. House Speaker Nancy Pelosi, D-Calif., and Senate Democratic Leader Chuck Schumer, D-N.Y., called the president's actions a clear violation of lawmakers' power to set spending priorities. "This is plainly a power grab by a disappointed president, who has gone outside the bounds of the law to try to get what he failed to achieve in the constitutional legislative process," Pelosi and Schumer said in a joint statement. California Gov. Gavin Newsom, also a Democrat, accused the president of "manufacturing a crisis" and diverting money that law enforcement in his state might otherwise use to fight drug dealers. "Our message to the White House is simple and clear," Newsom said in a statement. "California will see you in court." The president grimly anticipated such legal challenges in announcing the emergency. "Sadly we'll be sued," Trump said. "And sadly it will go through a process and happily we'll win, I think."